“Cooley’s” will be the name of the highly anticipated restaurant and bar coming to 8936 Santa Monica Boulevard in 2014, according to management. The bar takes on the namesake of its owner, nightclub impresario David Cooley, who created The Abbey gay bar in the early 1990s. Cooley will work with his management team at The Abbey, one of America’s most well-known gay bars, to bring his concept to 10,000 square feet of retail space, which includes the former Raffi Jewelry, Balliamos dance studio spaces and Unicorn Alley adult store. 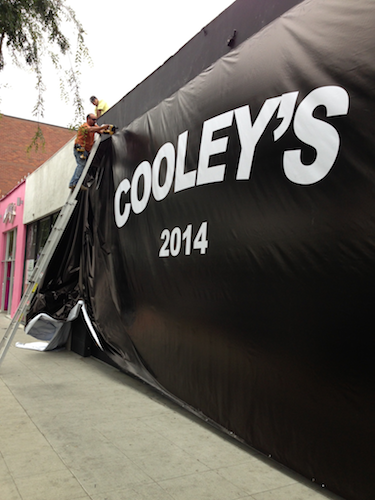 A large tarp, imprinted with the word “Cooley’s,” went up over the retail space on Friday. Cooley will also build a 3,000-square-foot patio overlooking Santa Monica Boulevard and a “large terrace” overlooking West Hollywood Park. We have Micky’s so why not Cooley’s? David Cooley is a “class act” and by far the best club/bar operator in Weho. This is exactly what that depressed and problematic stretch on the south side of SMB west of San Vicente needs in order to be revitalized. It’s exciting and Weho is lucky that David continues to invest here. There went any small hope that it would be unlike the Abbey. Are there going to be statues of Cooley everywhere?